Text source: Copyright © IPN, 2011. Used with permission. 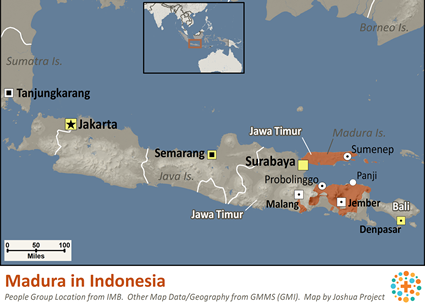 The Madura people are the third largest people group in Indonesia. The majority of Madura live on the island of Madura and in the eastern part of the island of Java. Other major pockets of Madura people can be found in Jakarta, Kalimantan, Sulawesi and even Singapore. "E tembang pote matah, angok pote tolang" means "it is better to die than to be humiliated". This is a common Madura sentiment that typifies their nature, a proud and purposeful people, who are known as fierce fighters and very hard workers. They are said to be the most loyal of friends but the fiercest of enemies. The Madura people are renowned for their harsh character and lifestyles. This is probably caused by their natural surroundings and their history of oppression by others, both of which have made life very difficult for them. Nevertheless, their harsh temperament can be seen positively if one examines their work ethic. Most of them work extremely hard and refuse to give up. Neither men nor women shrink from hard work in order to meet basic needs.The Madura have their own language as well as several dialects. The Bangkalan dialect is used in the regencies of Bangkalan and Sampang. The Pamekasan dialect is used in the southern portion of Pamekasan Regency and in the central part of Madura Island. 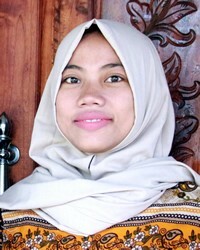 The Sumenep dialect is found in the Sumenep Regency. There are also the Girpapas and Kangean dialects that are used by smaller populations. The majority of Madura living on the island reside in closely-knit farming communities. But very few Madura living on the island only gain their income from farming. The climate is very dry and the land is not very fertile and thus yields only two harvests of rice and tobacco each year. Many Madura are fishermen, salt farmers and sailors on inter-island cargo ships. The Madura who live on Java generally do not own land, but become fishermen, sailors, bicycle-taxi drivers and unskilled laborers. The Madura are also known across Indonesia for their sate (skewered meat kebabs) and soto (meat soup). According to tradition, the first step in the Madura marriage process is for a parent to seek a suitable young lady for one's son (nyalabar). The next step involves contacting the lady's family (narabas pagar). If well received, the proposal leads to engagement. Among the Madura people, the family does not merely include close relatives (brothers, sisters and parents). The Madura maintain large family structures called pon popon gik semak, meaning that even distant relatives are considered close family. It does not matter if they are close relatives from the same grandparents or distant cousins. The majority of the Madura people are known for being very devout Sunni Muslims. Nevertheless, many seek security from the use of magic spells that are used in an attempt to control both good and evil spirits. The Kyai (the leader of a pesantren - Islamic traditional school) and the Hajj (one who has made the pilgrimage to Mecca) have a special place of honor in the eyes of the people. On average, the Madura live on one-third of the median Indonesian income. Education beyond middle school is an immense need for the Madura people, as is job skills training. Economic growth and spreading industrialization are having an impact on their island and they need advanced training in order to benefit from this growth. Their arid and salty soil could use desalination technology in order to increase their farming yields, as well as outside help in advanced fishing techniques to prevent denuding the earth and sea. Extracting fresh water from sea water would be another useful technology. View Madura in all countries. Location in Country: Jawa Timur Province, coastal areas of main island south and west of Surabaja city, southwest of Madura island; other island groups with speakers include Sapudi, Bawean, and Kangean islands; Java Sea, assorted islands with language communities under jurisdiction of Kalimantan Selatan Province.